Pavement survey device PicoR-Avtodor – Ледомер. Георадар. Контрольно-индикационный прибор Пикор-Лед. Официальный сайт ООО "ФПК "ЭСТРА" производителя георадара Пикор. 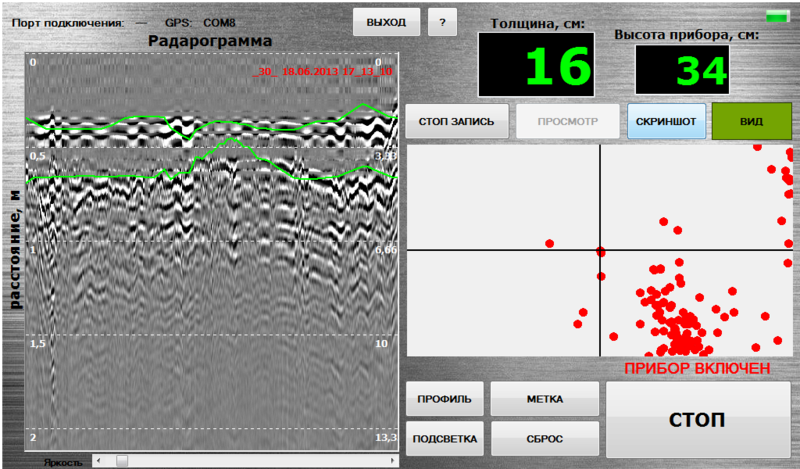 Development of the mass application device for road covering monitoring PicoR-Avtodor is conducted on the basis of an already developed and available device for ice thickness measurement PicoR-ICE 2M. The key feature of these devices is “one-button” operation fully adapted for end-user specific application. The device composition includes special software that allows an amateur non-professional user to get a set of required data on the structure and condition of the objects and opaque environment, even though the user has no specialized knowledge in the areas of radar and engineering geophysics. 1. The study of structural roadway building (what are the layers of the road pavement). 2. Thickness determination of the pavement individual layers. 3. Determining the type of underlying soils. 4. Search for voids, irregularities and changes in the road pavement. 5. Isolation of local watering areas. 1) The thickness of the asphalt and concrete pavement. 2) Quality of the coating (levels of layering on vertical axis and frequency of layer changes on a horizontal axis). 3) Type of the base (concrete - rubble – armed concrete). 4) The thickness of the base. 5) Lots of uneven pavement (“jumps” of layers, which take place due to similar type road surfaces or different road constructions in one class, for example base type changes). 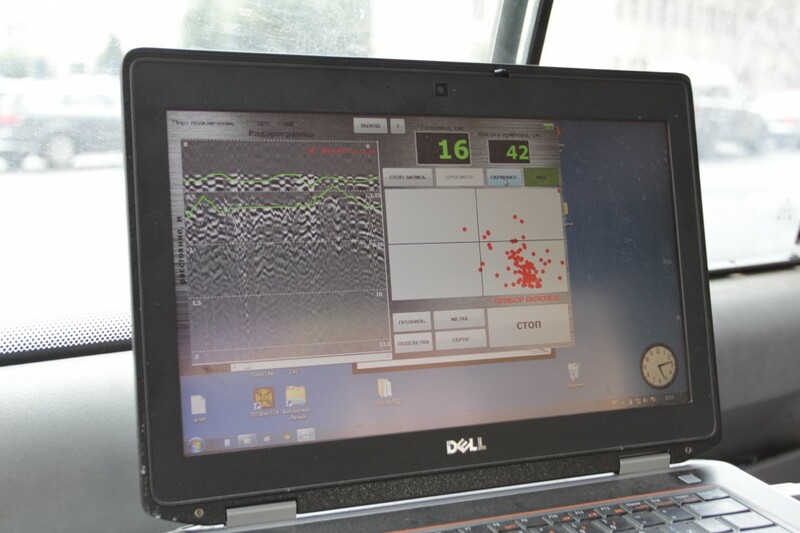 1) Determination of the road structure to a depth of 1 m. Survey data is collected by operating the device while driving a car (or a laboratory) on the road. 2) Antenna module device is the screened whole piece. A long USB-cable allows the data to be transferred to the tablet PC (or a laptop). The tablet PC will be inside the car, it will be sent additional data with reference to the profile observations. Also data can be transmitted using Ethernet port. 3) Power is supplied from the tablet PC (or a laptop), or from a battery pack. 4) The maximum speed of the laboratory is 40-60 km / h. Data update frequency is not less than one refresh per 10 cm (optimally 5 cm). 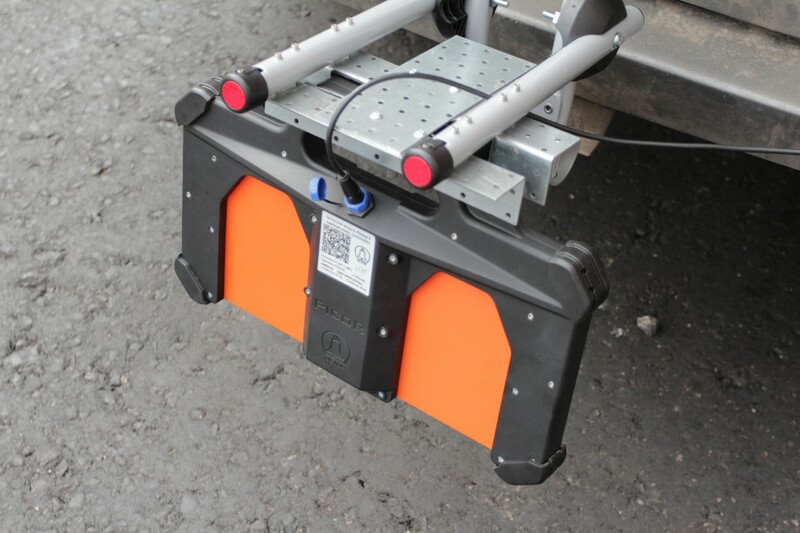 7) Antenna module is mounted on bicycle holder or a barbell with the wheel mounted on the tow bar. 8) The positioning will be done with the help of GPS-GLONASS module, as well as using the odometer. 9) It is also possible to install a number of antenna modules on one bar holder for GPR survey in order to profile an entire lane. Currently (4Q 2012) the device prototype is being field tested and upgraded to increase technical specifications by optimizing design and software. 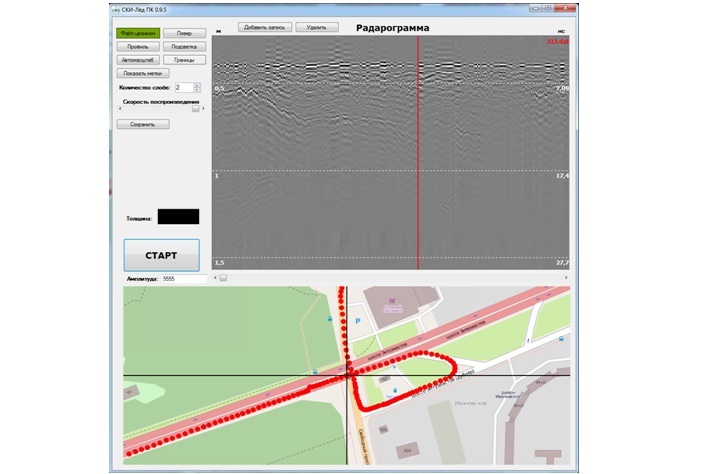 The images shows radargrams acquired during field tests on Moscow roads. This radargrams correlate with radargrams acquired using professional Mala Geoscience GPR. Device mass production is coming in Q2 2013.